Like many people, I love pizza nights. What beats just picking up the phone and sitting down, in thirty minutes or less, to a hot pie with oozy gooey cheese? Although we've lived in this house for over 6 years, we've yet to really find GREAT local pizza. In all honesty, though, laziness is a factor; the place we usually use is adequate, and we haven't continued searching around. I don't make my own pizza often, mostly because when I think of homemade pizza, I think of Nana's or my mom's - and I know I can't duplicate theirs! 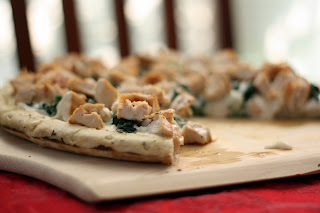 But every once in awhile I come across a pizza that's so tempting that I can't pass it up; this Chicken Alfredo Pizza from Kickin' it in the Kitch was surely among them! I cheated and used a store bought crust, but nonetheless, this was fantastic. I didn't love the Alfredo sauce I used, so next time I might even be enticed to make my own. Best of all, this reheated nicely for a yummy lunch the next day. Preheat the oven to 500 (or, if using a premade crust, follow package instructions). Roll out pizza dough to desired size on pizza stone. Spread alfredo sauce on crust and add the rest of the toppings. Brush the olive oil mixture on the crust. Bake at 500 degrees for 12 minutes or until crust is golden. Sounds yummy. I've had an alfredo recipe bookmarked to try soon. Maybe I'll make extra for pizza too. Superbowl Snack Throwdown: Sneak Peek!